I had the pleasure of interviewing Owen Meyers, Founder of Liquor Laboratory — best known as Liquor Lab. 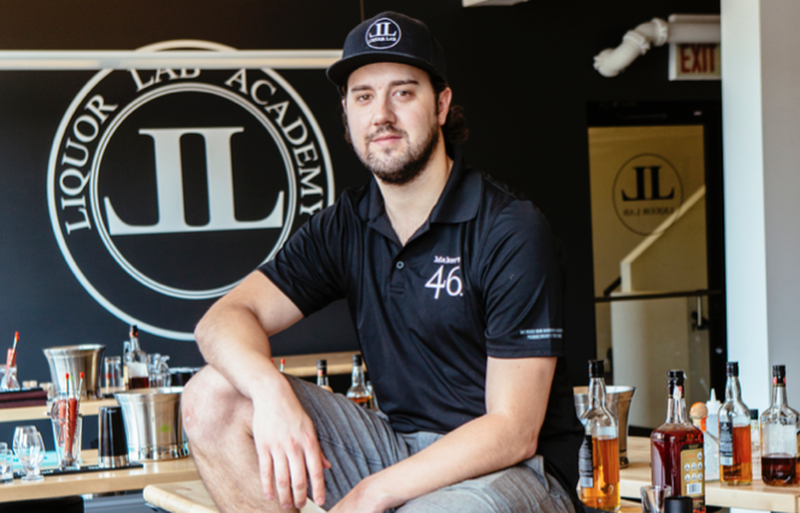 Liquor Lab is a hands-on, interactive craft beer, wine, spirits and cocktail event space where guests can experience custom beverages like never before. Think of this as a cooking class, but solely for specialty sips. While learning about recipe history and preparation, attendees shake, stir and sip delicious drinks. A category-specific professional leads each instructional session, as guests follow along step-by-step and discover the evening’s focus in a fun and exciting atmosphere. Liquor Lab encourages socializing with friends and meeting new people. During the tutorial, there are opportunities to interact with the class leader and win prizes. Thank you so much for doing this with us! What is your “backstory”? Can you tell us about your military background? Well, to be honest, It was kind of an unusual path. I was going to play college Hockey and West Point was recruiting me. My uncle had gone to West Point and I’ll never forget the day he told me “never live an average life.” He had obviously done well for himself, and I felt like going to a top-tier leadership institution would teach me things that I otherwise probably wouldn’t acquire at a normal college. I graduated in 2010 and left the Army after 2.5 years due to foot and back surgeries. I had an entrepreneurial itch and I was fascinated with the business behind booze, so I decided to pursue it. That path started at Jim Beam, and the things I learned there led me to create my companies. What from your time in the military, do you think most prepared you for business? The military prepares you for the business world in so many ways. The two biggest ways, for me, are planning and execution with respect to task priority: what absolutely needs to get done next, and problem-solving from the bottom up, rather than top down. Obviously, there are other key components like management and leadership within the organization but, I’ve always felt if you’re not constantly on the ground with your people learning and solving problems — like you do in the military — you risk an inversion of expertise and that is a dangerous spot to be in for a leader. My leadership style depends on the situation. In one sense, I embody a transformational style because I get others to see and achieve more than they would normally. In another sense, I am probably mostly a strategic leader in that I walk the bridge between possibility and practicality. The lessons I’ve learned, and the visions I have, seemingly put everything at an arms reach in my mind. What are your “6 Leadership Lessons Businesses can learn from military experience?” Please share a story or example for each. Counseling: I loved that in the military counseling was mandatory. What are your goals? What do you want to achieve? What position do you want to reach, and what are the skills needed to get you there? This was a quarterly discussion. When I got my first job in the spirits industry, not one person asked me those questions in two years. SOPs: Standard Operating Procedures are the playbook to everyday life in the military. Businesses that standardize processes naturally cultivate an easier path to success for their employees. Even within companies where decisions are constantly changing or made on the fly, an SOP, or a framework for problem-solving, helps ensure your vision is being followed even when you’re not in the room. Rehearsals/ Repetition: The military is one rehearsal after another, and for good reason. I like to imagine that an individual’s business, and his or her brand, is like a soldier. If you don’t practice over and over to perform optimally, then your going to get injured. Drink Water: Or in this case, take care of your troops so they take care of you. No one is going to perform at their highest level if they are not mentally sharp. Businesses that take care of their employees always see better returns than teams that neglect them. Believe in the greater mission: The military is exceptional at creating a vision and a sense of shared purpose. I truly believe that this is one of the most important parts of a business. Every person in the company needs to believe in the greater vision and how every little piece of the puzzle creates value for the business and its mission. Strategic thinking: Modern Warfare and the way the military prepares for battle is constantly evolving. Leaders in the military are not bound to old norms and are not resistant to change. They embrace change and use it to improve their strategy and exploit enemies weaknesses. Old norms and outdated processes show a failure of leadership at the highest level or, as I like to say… remember Blockbuster? The future of many industries relies heavily on millennials and Gen-Z in regards to consumers and talent. Can you tell us something you or your company is doing to stay ahead with attracting both? We are in a unique position. On the surface, we have a cool factor just out of the nature of the business. But if you open the hood and look underneath, we are bringing data, consumer analytics, design, branding, education and more all into the spotlight WITH BOOZE! What’s more attractive than a career path working in an industry that has endless creative application and cocktails constantly surrounding you? I’m a strategic thinker that looks out several years into the evolution of Liquor Lab. I don’t have a name, but the person I would like to have a cocktail with understands why experiential business models in this industry, the data they collect, and what you can do with it, is ahead of its time. Chris Quiocho is a combat veteran and pilot of the United States Army. Millennial leader and CEO of Offland Media, the premier content partner for business aviation. Chris is an insightful and motivational public speaker, and an emerging thought leader for the aviation industry.